Megan, age 16, attends Harvard-Westlake School in Los Angeles. She has been playing violin under the tutelage of Mr. Elmer Su for the last 6 years. 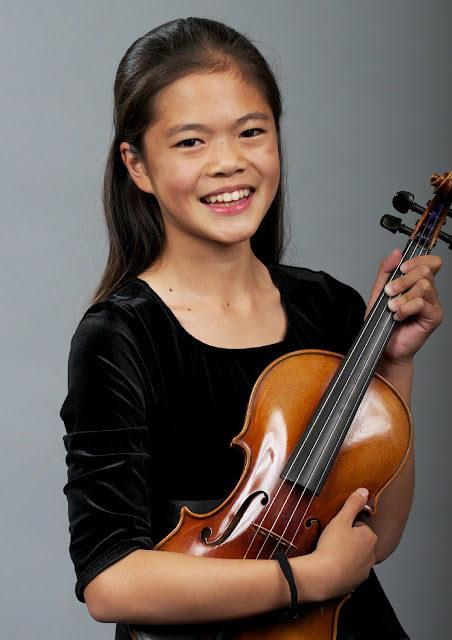 She was the concertmaster of the award-winning Harvard-Westlake Middle School Symphony on their first international tour to London where she was a violin soloist playing in Cadogan hall and Southwark Cathedral. She played in the inaugural concert of the Young Artists Symphony Orchestra under the baton of Alexander Treger in UCLA Royce Hall. She has performed as a featured soloist with the Palos Verdes Regional Symphony Orchestra, the Palisades Symphony, and the Santa Monica College Symphony Orchestra on the Broad Stage as winner of the Westside Music Foundation Concerto Competition. Megan has won many accolades in her solo and ensemble violin competitions, including the Southwestern Youth Music Festival, the American String Teachers Association Greater Los Angeles Competitions, the Lansum International Music Festival, and the California Association of Professional Music Teachers Contemporary Music Competition. Megan performed at Carnegie Hall in December 2016 as first-place winner of the American Protege International Concerto Competition. She is also a scholarship recipient from the Westside Committee of the Los Angeles Philharmonic. Megan has also won piano competitions at the Southwestern Youth Music Festival and the Southern California Junior Bach Festival Complete Works Audition. In addition to her musical activities, Megan is an avid mathlete and enjoys doing yoga at school in addition to being part of the school publication team.